No place to dig a garden? You can still grow your own food! A colorful dressing is excellent served with a hearty romaine lettuce mix and garnished with croutons, dried fruit and a grating of fresh cheese. This easy prepare stir fry is suitable for a wide range of seasonal produce, topped with the sweet pea pods. Try this soup as an appetizer. When sweet peppers are plentiful, why not highlight and serve this Three Pepper Salad as a composed salad to dress up an elegant meal. This salad makes the most of garden fresh vegetables. 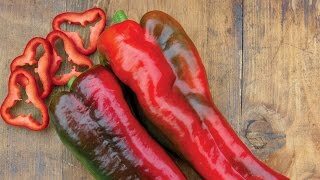 Growing peppers is a rewarding experience for every gardener. A quick and easy crowd pleaser. Beautiful and delicious, this quick summer soup will quickly be a favorite. Delicious and colorful summer salad. A fiery fragrance with a sweet and hot punch. HUGE peppers over a foot long with excellent flavor, color and texture.